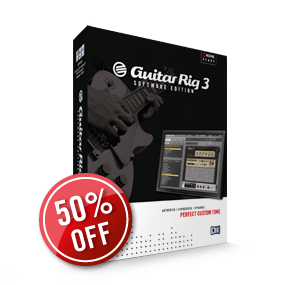 Last chance: GUITAR RIG 3 Software Edition, with 12 amps, 44 effects, 23 cabinets, 4 rotary speakers and 9 microphones is available for just half the regular price. In addition, the road-ready GUITAR RIG 3 Kontrol Edition which includes the Rig Kontrol foot controller with built in Audio/MIDI interface is available at an incredible 20% discount. The offer is valid for both the NI Online Shop and at resellers – but act now, these offers expire August 31st.